I've worked for the Indians for close to six years now and I have to admit that every time I go up the steps behind home plate to get to the field, or make the turn in the lower level to walk out the elephant doors in left field, I still have that moment of awe. There is nothing like the feeling you get when you are about to go onto a professional sports team's field. It's a feeling of excitement and calmness mixed in with heart pounding joy. I get to do it every day and anytime I want, yet that feeling never fades. What makes it even cooler is when I can take someone out to the field who would have never dreamed they would have the chance to be that close. Fabian Washington from Cleveland, Ohio was able to experience the sensation on an even grander scale at his recent trip to Progressive Field. The Cleveland Indians teamed up with Strike Force Baseball Academy and the Diamond Boys Organization to hold a "Dream Day" at Progressive Field. The two groups worked together to put on a baseball clinic for children and adults with developmental disabilities who have never really had the chance to play sports. "I learned how to hold a baseball properly, I learned how to hold it across the 'U' and not just hold it any sort of way. It's just awesome to come down here. I"m having lots of fun just playing around on the field... and I love the fresh grass," says Fabian. Invited to the event were members of Our Lady of the Wayside and also Rising Star. Meg Downey, who is the Director of Specialized Services at Our Lady of the Wayside and helped put on the event, probably summed up the event the best. "The best part of yesterday's Dream Day Clinic was that Gino, who lives at The Wayside's Lake Home, believes he pitches for the Cleveland Indians, John who attends The Wayside's Day Program, believes that he hit a home run and every consumer participating did what so many of us take for granted -- they played ball." The day ended with an intrasquad game before they broke for lunch. 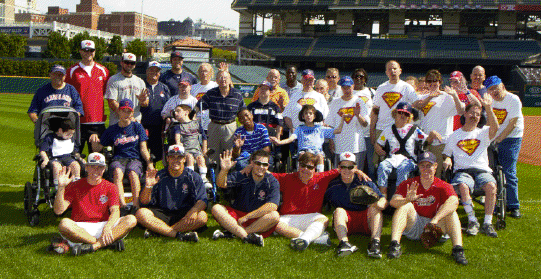 The participants used the skills they learned to play their very own game of baseball. They played on the same field where their heroes play. The helmets were the same ones that past Indians players have used. The balls were Major League baseballs and the grass -- well, like Fabian said -- it was "fresh"... just like the pros play on.